My previous attempt at building a simple IR pen did not work as expected. The power source was too weak for the IR LED, and consequently the Wiimote had difficulty detecting the IR light. For my second attempt I purchased an IR LED, some wire, a momentary switch, a 10 Ohm resistor, and a battery holder for two AA batteries. 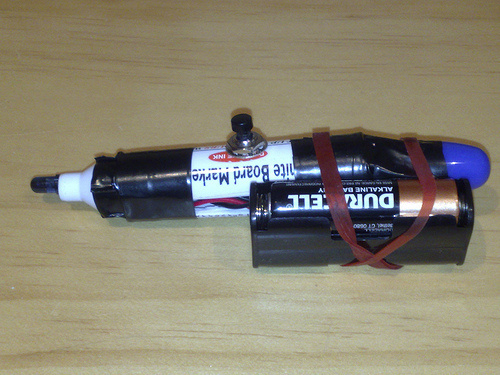 I also had a whiteboard marker lying around, which I used to create the casing for the IR pen. I wired up the circuit so that the IR LED was in serial with the switch, resistor and battery holder. I then cut off the nozzle from the whiteboard marker casing. I needed space to fit the switch, so I cut the cylinder shaped casing in half, and drilled a hole to push the switch through. I then popped the LED through the nozzle, and wrapped the casing around the circuit. Everything was then held in place using electrical tape. It was a prototype, so I didn’t bother with aesthetics, which the rubber band holding the pen and battery holder together clearly shows. I am glad to report that this particular IR pen works perfectly with my laptop screen and the Wiimote. However, I will need to test it out on a projected image from a data projector before officially giving the thumbs up.